Alena is not a particularly happy girl. She’s the poor kid in an affluent school. She’s the target of a predatory gaggle of bullies, the leader of which is a special kind of terrible. As if that weren’t enough, she’s also struggling with some very heavy issues concerning the recent death of her best friend, Josephine. Oh, and her dead friend is still hanging around, further complicating her life. 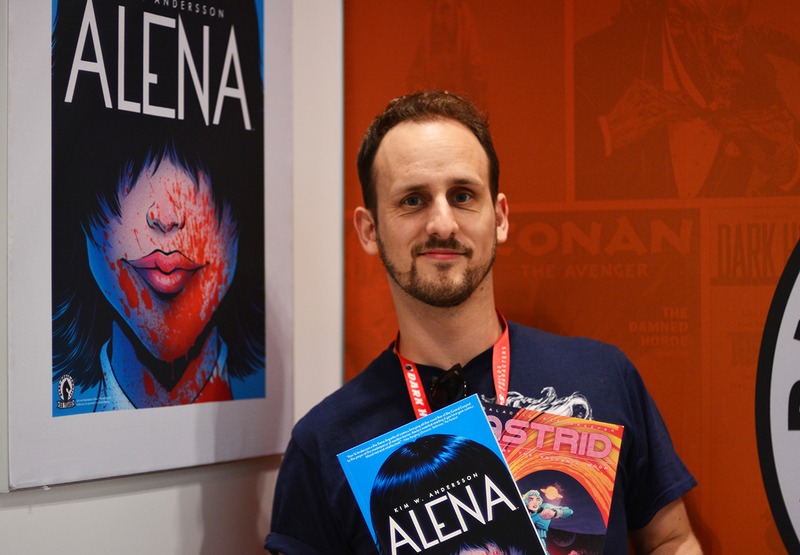 Paste caught up with Andersson while he was in town for New York Comic Con to chat about Alena and his new project for Dark Horse, Astrid. 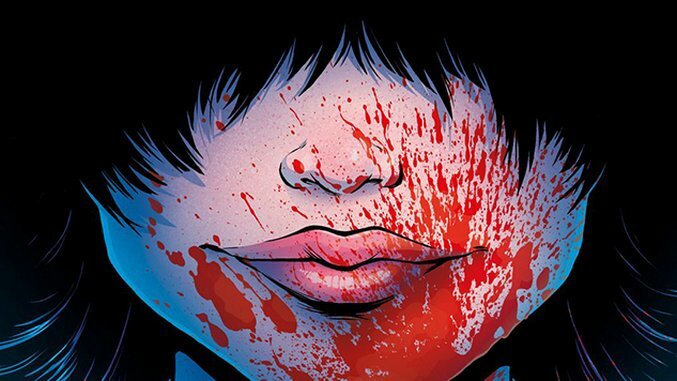 Paste: Horror and teen angst go well together. How’d you try to make it different? Kim W. Andersson: When you’re writing about teens, for me at least, you always start writing about angst, because that’s what being a teen is all about. Everything happens for the first time, and everything is so dramatic because it’s the first time you’re experiencing it. I did Love Hurts for a few years in a magazine called Nemi. I gathered a following and there were a lot of teenage girls reading my comics, a lot of goth and emo teenage girls. I was so happy about that because I was doing exactly the comics that I wanted to make. So I guess that meant I was a goth teenage girl at heart. So when I started doing Alena, I wanted to give them something more, a story of substance. I feel a lot of things that are aimed at that group kind of patronizes them, and I tried to not do that… Hopefully I succeeded. Paste: What sort of things inspired Alena? Andersson: Carrie by Stephen King—more the movie—was a big inspiration for me. I’m inspired by a lot of horror movies. I really like Junji Ito’s Uzumaki and Gyo. Japanese horror translates very well in the comics medium. 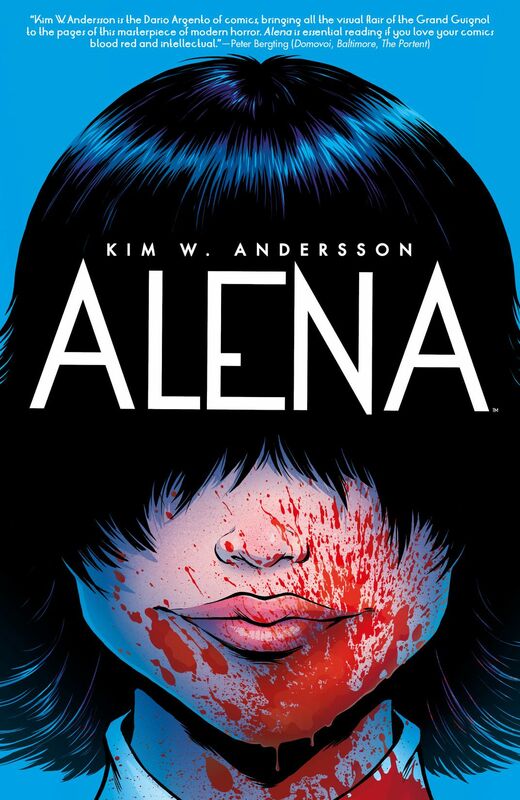 When we started making the movie, I had to revisit Alena and re-read it several times, and think, Why did I do this book? I don’t really have to ask myself those questions when I‘m making a book because I’m all alone. I both draw and write it, so I just make it, but when you’re in a team, those questions arise in the process. Alena contains a lot of different subgenres of horror—it’s a thriller, a slasher, a lot of different things. Paste: What’s your favorite horror subgenre? Andersson: I’ve seen so much horror. [Laughs] That sounds bad—I’ve seen so many horror movies! It all kind of melds together now for me. That’s why I’m setting horror aside for now and I’m doing sci-fi. I’m trying something new, but I think in the first book of Astrid you will definitely recognize my horror. Paste: It’s a very atmospheric book. How would you say that atmosphere added to the suspense? Andersson: Color is the strongest tool you have for reaching your reader subconsciously. The drawings you read, the ink you see, but the color you experience. I picked a couple of colors before I started and I tried to hold to that scheme. This was my first graphic novel, so I had to limit myself in a lot of ways. It takes place in just a few places, it has a limited color scheme and just that many characters. But those limitations are almost always good—it gets you creative. Paste: It’s a gloomy look. Is that just what Sweden looks like? Andersson: [Laughs] I don’t know if it takes place in Sweden, actually! It takes place in kind of an alternative place. They play lacrosse; no one in Sweden plays lacrosse. There’s one team in the whole country, and they had to play in the movie, but they’re adults and we had to dress them up as teenage girls. I chose lacrosse because it looks cool. There’s a contrast where, in some ways, it’s girly because they have skirts and they braid their hair, but on the other hand they have this teeth guard that kind of transforms their faces and these glasses that makes their eyes really terrible. Paste: Tell me about stepping into the mindset of a teenage girl. Andersson: It’s kind of a sad story and I think I was a much more sad person when I wrote it. I don’t think I could have done it today. It’s about a lot of girls, but it’s me of course. All those characters are me, different sides of me—all those things they’re wondering about, all those weird experiences—come from me. One of the reasons I always draw girls is the political reason: I think there should be more girls in comics, more good female heroes (not just female versions of male heroes). Another reason is it’s easy for me to hide behind girls. As a man, I’m also a “victim” of gender stereotypes, so when I want to write about sensitive subjects and feelings, I have a hard time doing that because, as a man, I’m taught not to approach those things. But if I start writing about girls, I have an easier way to approach those sides in myself. Paste: We hear a lot about it here, but Is bullying a big problem in Sweden, too? Andersson: It always is. The book takes place in a fancy private school, and I’ve never been to one of those, but I think it’s an interesting environment. There are some class issues to the story as well. But those schools, in Sweden, they have been in the media a lot because there’s been a lot of horrible hazing. Paste: There’s a lot going on here—bullying, sexuality, class issues. Did you worry about overreaching? Andersson: Every day. I always feel like that, but I try to push that aside. I have a lot of colleagues and we always look at each other’s stuff and take comfort from each other. We don’t really have the good editors in Sweden that you have in America, and that’s one of the reasons I wanted to be published in America. Paste: There are a few motifs that come up a lot, mainly the letter and the scissors. Tell me about choosing those. Andersson: For the scissors, I wanted a weapon that comes back. It’s not only used to kill, they actually use it to cut things. The letter is an internal symbol, the scissors are an internal symbol and when they meet, that’s when the story explodes—when she cuts the letter up, that’s where the story kind of spirals down into madness. But also, the scissors I imagined are like tailor’s scissors. I don’t know if it’s true or not, but I felt like it was a female weapon in some way, whereas a hatchet or something would have felt like a male weapon. 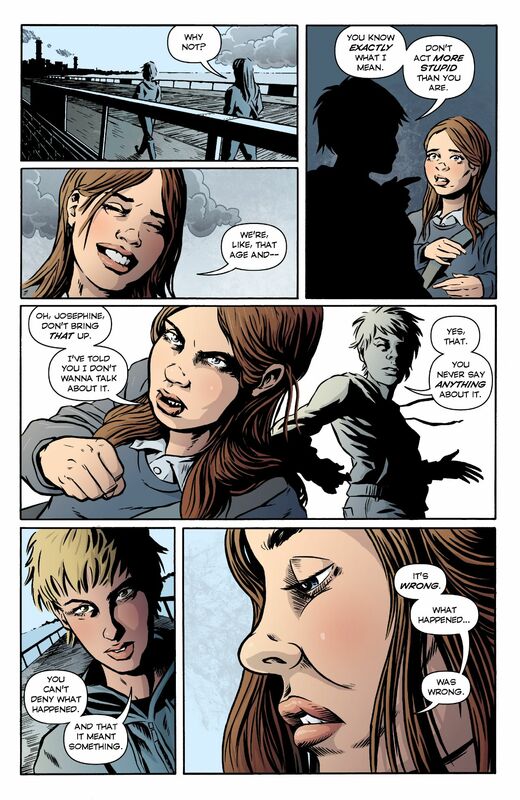 Paste: It’s a grounded psychological story, but with comics you could have gone with a straight-up supernatural angle. Andersson: Did I really? I’m not sure that I did. I just wanted to make a cool story. It actually has kind of an open ending. The prologue and epilogue are very important to the story. Without those two, it wouldn’t make much sense. It ends with [spoiler alert] her falling off the bridge, but you don’t actually see if she was pushed off or if she jumps off. And everyone who reads it is completely sure that she fell, and half of the people say no, she was pushed. But you never actually see. 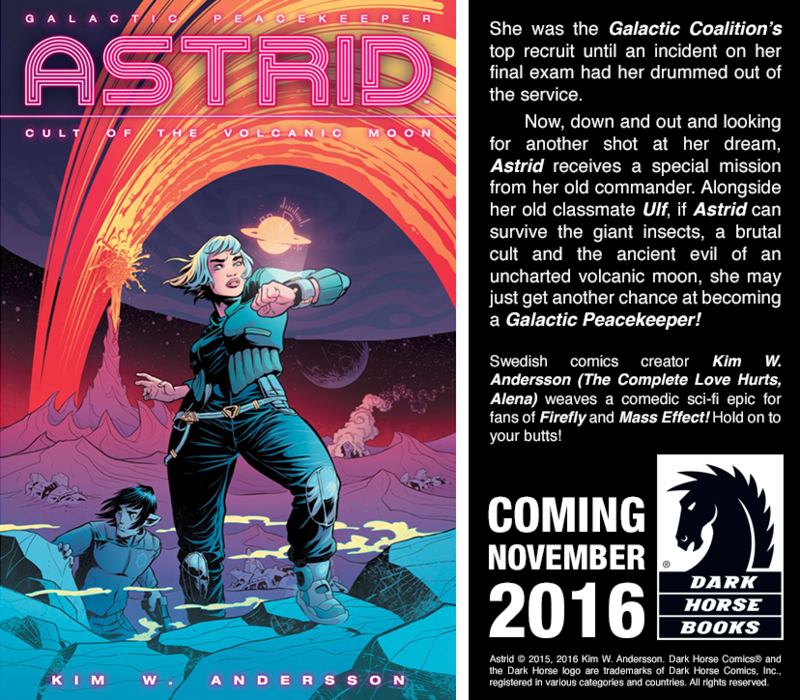 Paste: Tell me a little about your other new book with Dark Horse, Astrid. 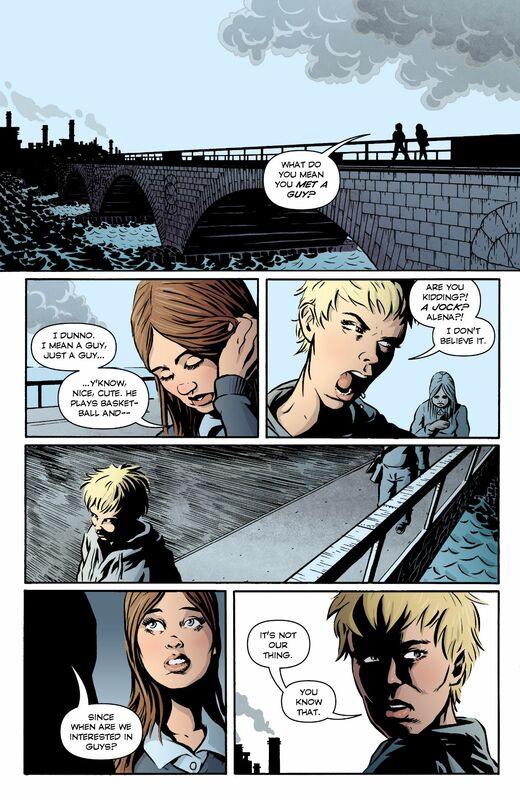 Andersson: First, I did a bunch of short stories, then I did a graphic novel. Now, I finally made a comic book character that we’re going to do a lot of books with. We’re going to follow her and her friends for a long time. I worked on the first book for almost four years, hopefully the next book won’t take as long. I really love her. She’s a really cool character. I also wanted to make an adventure story, but I wanted things to matter. In a lot of adventure stories they just brush themselves off and never think of their friends that died, they just move on. I’m dying for you to read it.